Pictured above, Heather Windes and Timothy Deshields tighten bolts on one of the picnic tables. 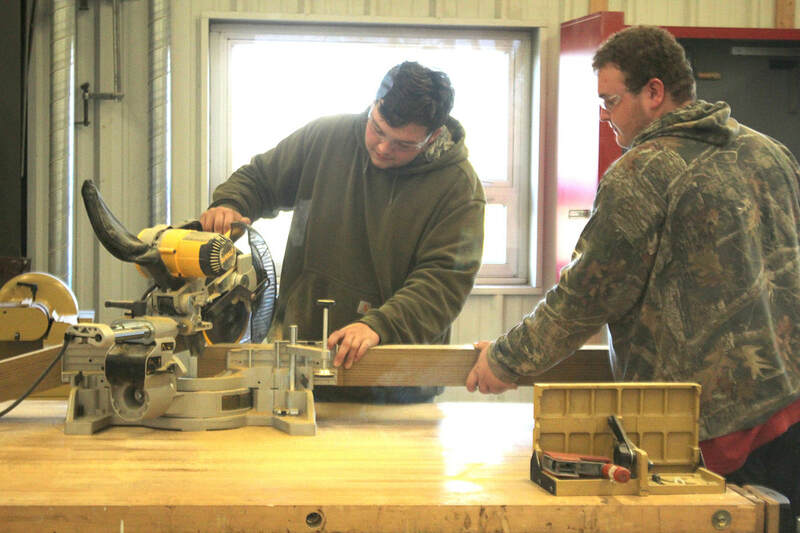 Above, from left to right, Aaron Beeson uses a saw to cut lumber while Jared Hamilton stabilizes the board. Thanks to a grant, the Southwest ag students started a project that will aid students in learning as well as helping the City of Seligman park. 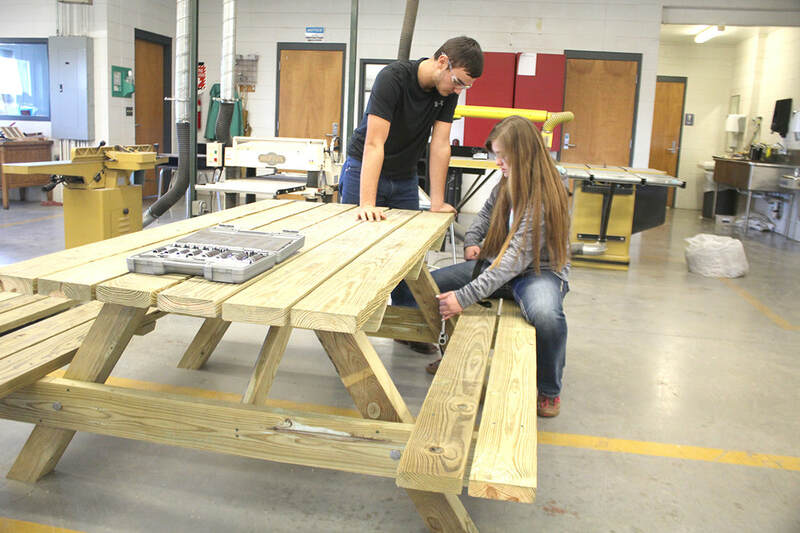 The Southwest ag students applied for and obtained a grant that is allowing them to build three picnic tables and one bench to give to the city to make the park more comfortable for visitors. According to Southwest ag teacher and FFA advisor Rachael Brown, this is the third year the students have applied for and obtained a grant to help the community. She said, “It was my leadership class who wrote the grant. When we get the grant idea each year, we talk about, as a group, what the community needs. Students who attend Southwest live in southwest Barry County down to the Arkansas border, including Washburn and Seligman. The grant students applied for was the FCS Financial Shaping Rural Missouri Grant. They were awarded $500, which allowed the school to purchase the materials and plans for the three picnic tables and bench. Once the school was awarded the $500 grant, then the funds were turned over to the other FFA advisor, Bill Caldwell. Caldwell’s agriculture structures class is doing the construction. As of Monday, November 20, two tables were finished. Caldwell said he anticipates they will be done and delivered by Christmas break. Brown said in the past, the Shaping Rural Missouri grant has been used for different projects. The first year, they did siding work for the local clothes closet in Washburn. Then, last year they used the money to repaint the First Baptist Church in Washburn. Caldwell said once the picnic tables are done, his ag structures class will move on to something else. He said they plan to do Adirondack chairs. Last year, his class built a storage building on Southwest District’s campus. Thanks to the efforts of Southwest’s ag students and teachers, the City of Seligman’s park will have better seating options for people enjoying the grounds.